Moving things is always fun. Anyways hopefully all my DNS entries for superglobalmegacorp.com are where I need them. 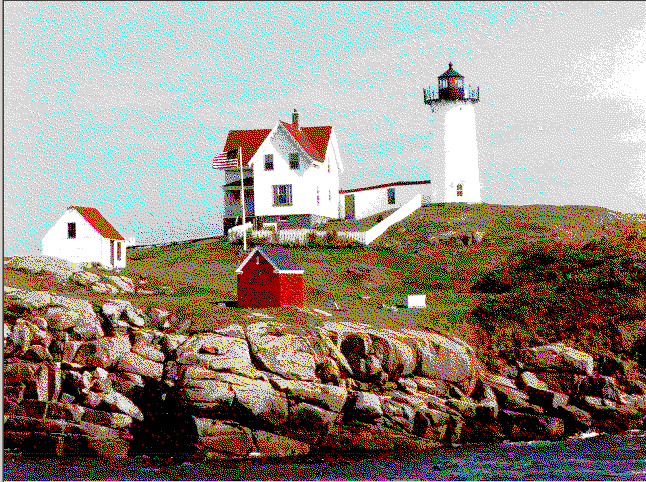 speaking of the OS/2 2.0 lighthouse, thanks to google images, I just googled it.. 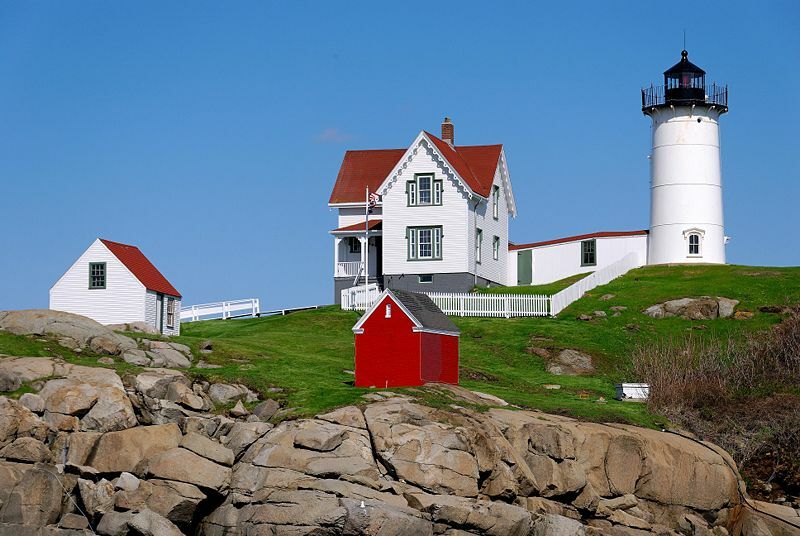 It is Cape Neddick Light. I know it’s silly but I always wanted to know where it was. I just read this great post on OS/2 Museum, and I was greatly intrigued. While a kind person had sent me a copy of this rare pre-release version of OS/2, I never could install it because it crashed on my real hardware, nor would it install in any emulator I had access too. Apparently the two problems for this version, like the 1.x series of OS/2 revolves around timing issues, and floppy drivers. While the limited availability seems to be more laid out like a 1.21 version it still 32-bit, so attempts to replace the floppy/country.sys from 1.21 or 1.3 just result in instant crashes. Back when I ran OS/2 the big issue with 486 computers and booting was the L2 CPU cache. 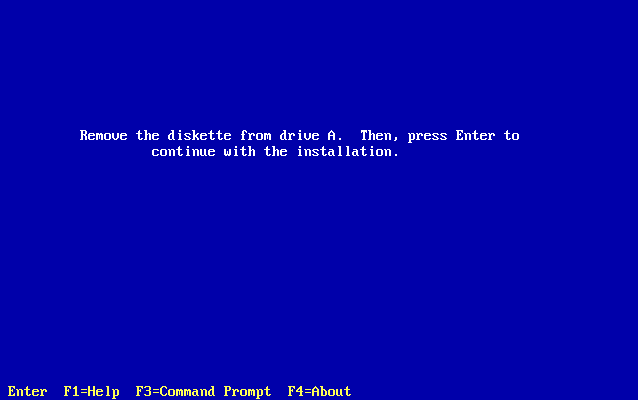 It would induce all kinds of timing problems with booting from floppy to install. And the number ONE fix for this was to disable L2 (and even L1) cache, and the install could proceed, then once you are booting from hard disk you could re-enable them. What if I used the 2.0 GA to boot up the LA install program? So I simply copied the following files from LA’s disk1 onto 2.0 GA’s disk1 .. 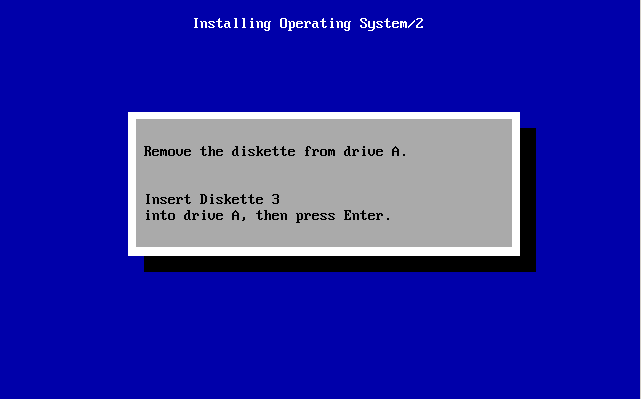 So then I simply booted off the GA install/disk1 then swapped in the LA disks as needed. Surprisingly it boots from the hard disk on Virtual PC 2007 without issue. It traps on Qemu. So as a ‘quick’ tour, here is the LA desktop.. .It’s… almost 2.0 but not quite there. The LA includes a tetris clone, Blox that never made it to the GA. I wonder if it’s a SDK example or maybe IBM didn’t want to get into licenses etc etc..
Also the applications were more or less the same, although there is some icon differences and it feels kind of rough around the edges as it isn’t finished but it does work. Another weird thing I noticed while looking to see if there was any exciting bitmaps in OS/2 2.0 LA, and finding it’s the same lighthouse. But something looked different, I’m amazed I even caught it. 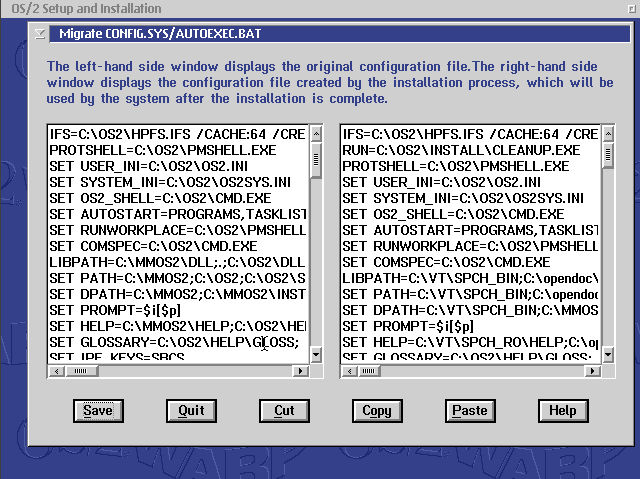 So I quickly fired up an OS/2 2.0 GA VM, and put them side by side. Do you see it? I figure someone out there who wants to run OS/2 LA will want this to get this OS running. At the same time, I haven’t even thought about seeing if LA upgrades 1.3 and how 2.0 GA overlays the LA. While browsing around for some hints on how to configure LORD (Legend of the Red Dragon) on Synchronet, I stumbled upon fTelnet. 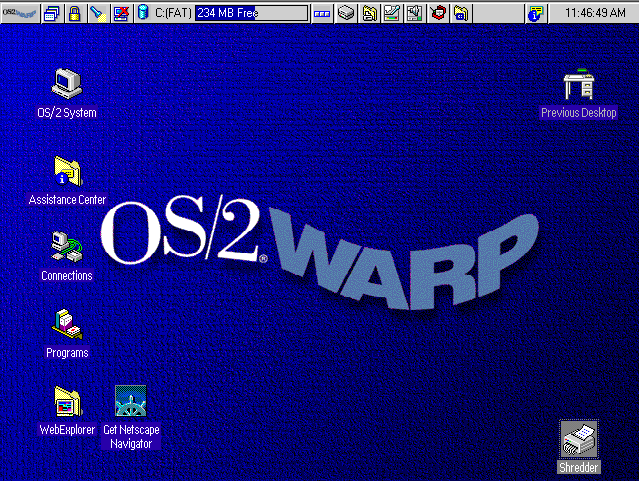 I’ll have to detail the whole OS/2 on Qemu & Synchronet experience later. “The requested URL / was not found on this server”.. What the hell? And no matter where I tried to go, this is what I got. I don’t know what on earth it’s trying to do, but it’s certainly trying to pass me through google. Is it some forceful way to see who’s using their services? I know at some point they had some ‘browser acceleration’ feature that was a great way to get around corporate firewalls… But it’s long gone. I’m not sure what was going on but I fixed it by simply changing my DNS to something like 4.2.2.4 and away it worked. I know it’s largely useless, but if you wonder why older HTTP 1.0 stuff doesn’t work, and you are using Google’s public DNS scheme it could be this…. Or not. I don’t know. Author neozeedPosted on May 26, 2011 May 26, 2011 Categories virtual networking2 Comments on Google’s DNS vs OLD browsers.. When OS/2 4.0 came out, something was different. First it was 1996. 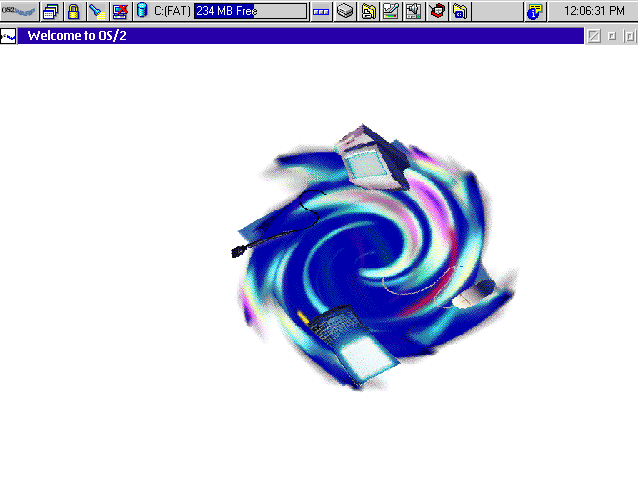 The Windows 95 tidal wave had happened. Users everywhere were moving to Windows 95. Office 95 was also a big deal, a real 32bit version of Office that was sold on retail shelves, unlike Office for NT. And if that onslaught wasn’t enough, a month earlier Windows NT 4.0 had hit the shelves. And as I had mentioned it was so popular and so desired, where I worked people were going out and purchasing it themselves, and replacing their corporate sanctioned OS (Windows 3.11 or Windows 95) as the productivity of not crashing or the conflicts of old/bad drivers etc etc. At this point to say OS/2 4.0 had significant competition is an understatement. Not to mention how Microsoft leveraged it’s OEM channels to force bundling & instillation of Windows/Office, even on IBM hardware. When I got OS/2 1.3 it was at a HAM Fest, as nobody sold it retail. 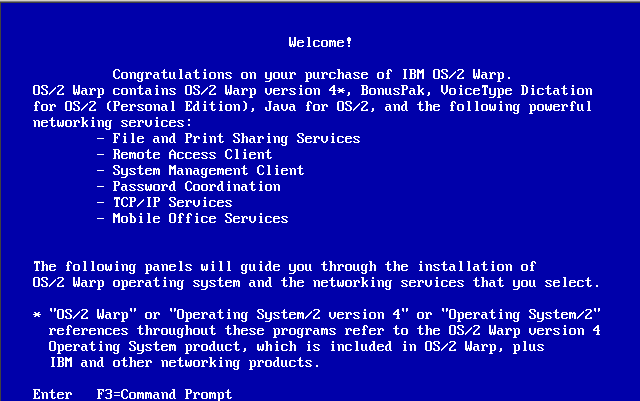 OS/2 2.1 for Windows, and OS/2 Warp were all sold through retail channels. When OS/2 4.0 had finally gone retail none of the local retailers in the Ft Lauderdale, Miami area were going to even stock it. Instead me & a friend had to drive all the way up to some small retailer out around Boynton Beach. Needless to say this release wasn’t going to be a big one. While the hype around Merlin, had been quite intense, when it had come time to deliver it seemed at this point IBM was only going to push this out because of all the time & effort that went into it. But the PowerPC version was basically dead, and it seemed with them the hope of OS/2 had gone with them. 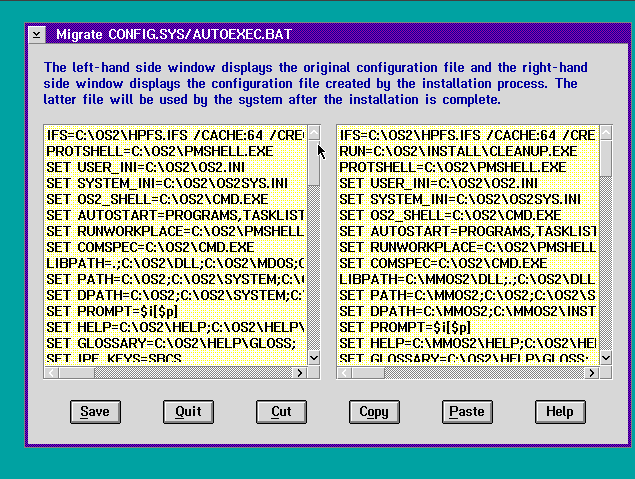 Also at this point there were no plans to build a Win32 subsystem into OS/2. This meant that you couldn’t run Office 95. 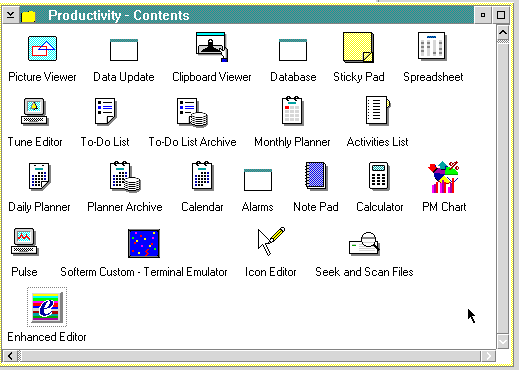 And of course when Office 97 came out, there was no way you would be running that on OS/2 either. Oh sure there was this half hearted framework, Open32, 800 some popular Win32 calls adapted to OS/2, but it was only source compatible, there was no way it’d run stuff on OS/2 (while others have taken up the torch via Odin). Ok, enough with the back story! Let’s upgrade! Hello old friend, it’s time to go to the end…. The installer had now swelled up to 3 disks. I’m not sure if 4.0 was even available on floppy disks. I know the version I had was on CD. I’ve got to admit it, this boot logo looks the best. Although in my opinion they should have dropped the Warp thing, at this point 4.0 was it’s own thing, and even in this logo they are using warp like a deformation, not warp speed. Could it have been that hard to slap some Star Trek people on this? In this day in age, there would have been a ‘Jean Luc Piccard’ limited edition. But I guess IBM wouldn’t want to offend the STAR WARS fans or something. Well this is a change, a welcome screen touting new and exciting features! 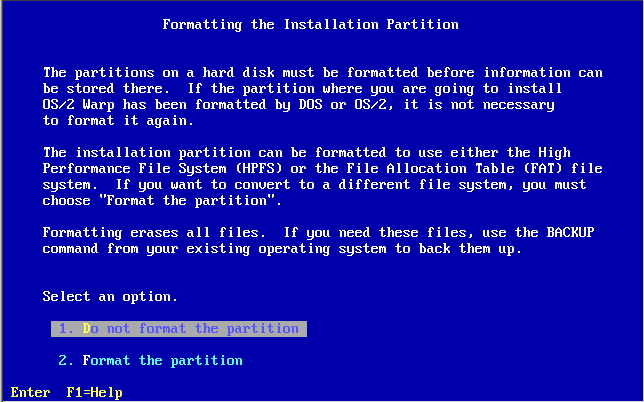 Yep let’s NOT format the disk. Although in retrospect I think I really did only half read this once, and I just saw the “convert to a different file system” part and said oh yeah let’s do this HPFS thing! … Too bad I missed the “erases all files”… Maybe a blink tag would have been appropriate there… Oh well it’s been a long long time since then. 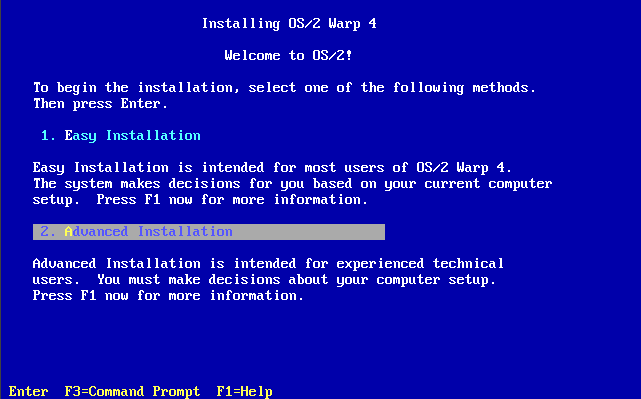 Now with OS/2 prepped, it’s time to go into the GUI boot…! And as a sign of the times.. My 500MB disk is looking pretty small with all these features. 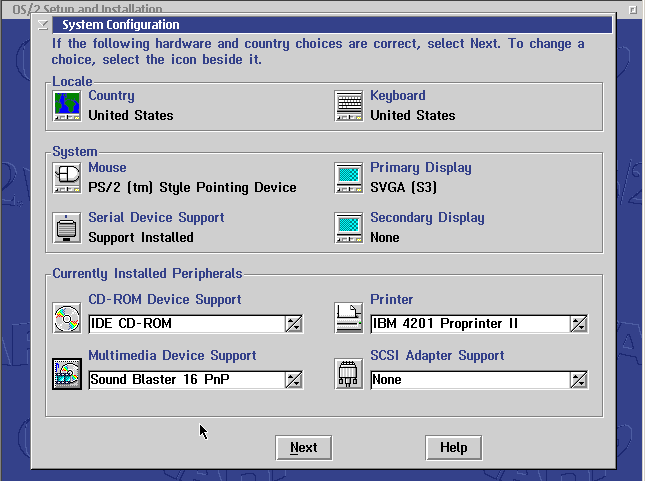 It does support DHCP, and it found the DC21x4 network card in Virtual PC. So far it looks pretty good! Let’s let the installer do it’s thing! 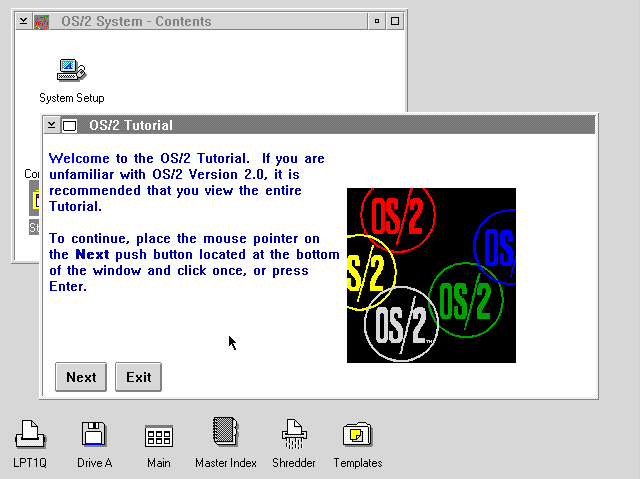 Also you may notice that OS/2 4.0 looks nothing like the prior versions. Gone is the old 5 color flag thing, and in with the ‘warp bounce’ thing. I’m sure all of this is helpful to someone. But it’s not me. I just assumed it knows what it’s doing. There is this weird animation of a computer and a LAN going down the drain or something..
Then we get this welcome screen. Closing out of this, I get to the desktop! Which is… different. It sure looks like *NOTHING* desktop wise was preserved. Although I do like the status bar up top. Right away I know I’m using more then half my disk! 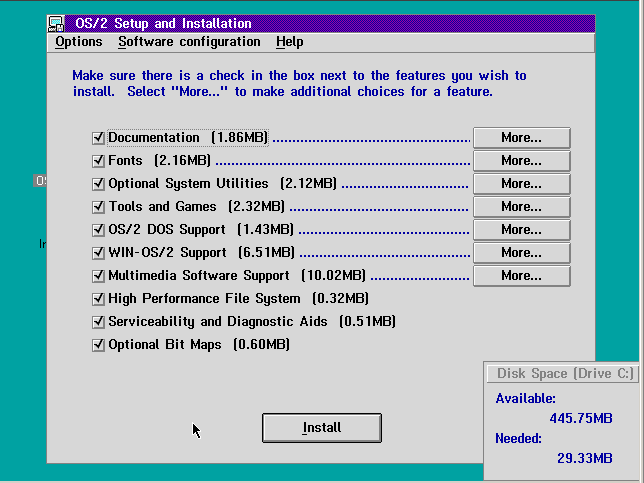 And there is some OS/2 answer to the start menu.. Which in the world of Windows 95/NT 4 feels. Weird. So quickly let’s see how we stack up in terms of legacy applications. Excel acts weird. I don’t know if this is to blame on the new graphics drivers, or what. 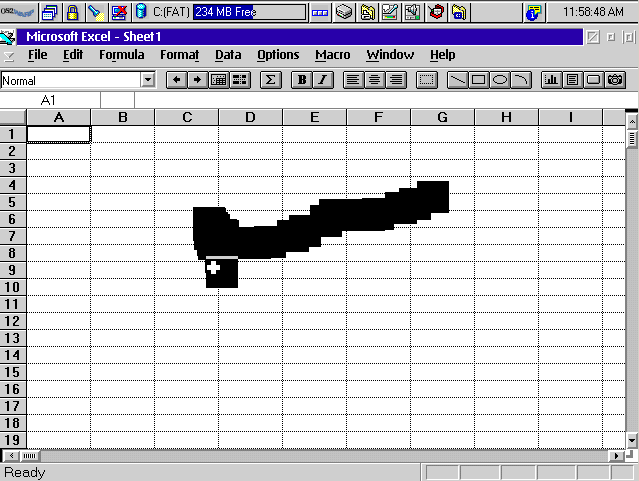 Granted Excel is circa 1991 but it’s worked up to this point. Ironically, Word 1.1 for OS/2 works great. Although it’s far obsoleted in terms of it’s document format, left behind by Word 2 for Windows, this version just keeps on rocking. 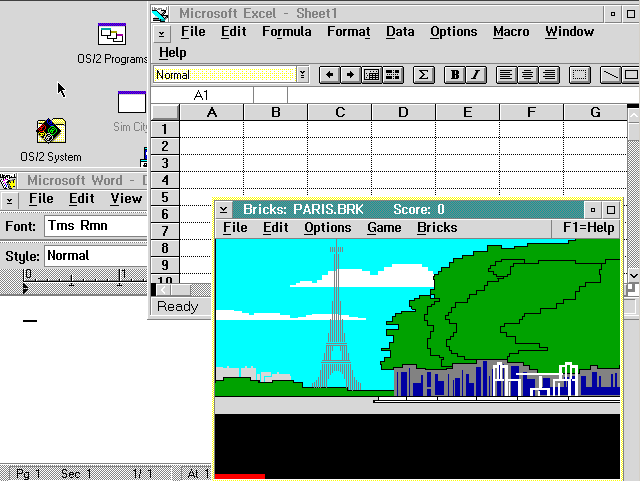 I can’t help but wonder if I had an older version of Excel that it may have worked better. 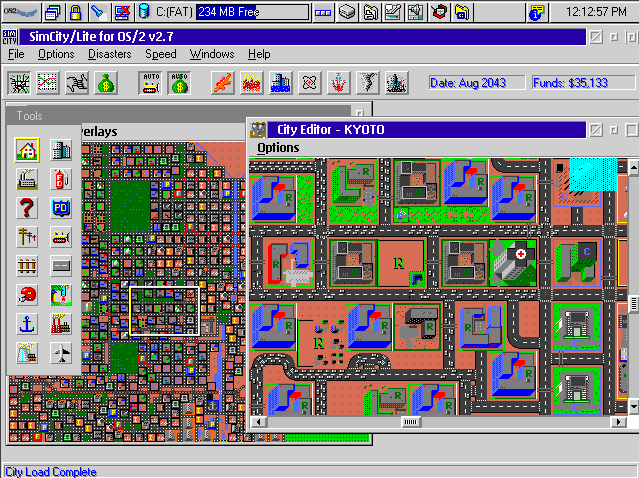 SimCity loads up and plays fine. No weird artifacts. Even digging through the old desktop folder I find my old stuff from OS/2 1.1 and I fire up bricks. Talk about horrible! They are almost all GONE! Even poor Neko didn’t make the cut! And yet gwbasic 3.23 from OS/2 1.0 made it. Honestly I really feel let down by IBM at this point. 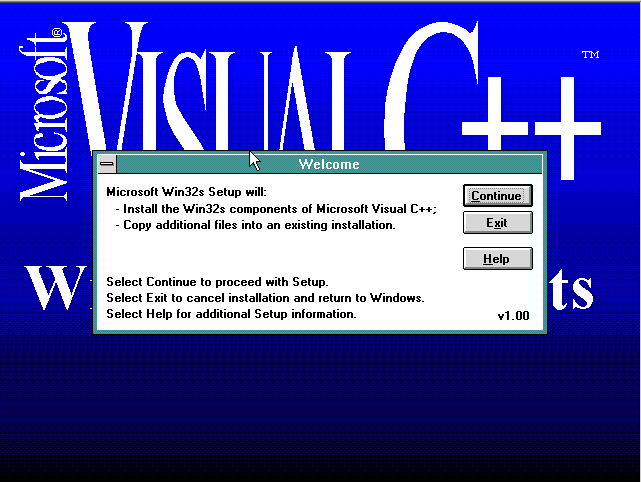 Another thing that didn’t make the cut was my Win32s install. It was completely removed. 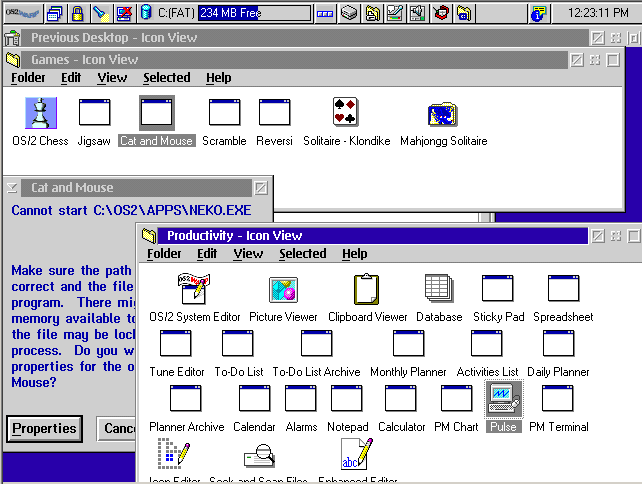 I almost wonder what would have happened if I’d installed apps in OS/2 2.0’s Windows 3.0 .. I may have to time travel to find out. Also any attempts at running MS-DOS in a full screen freezes OS/2. Looking at the Excel glitch I can’t help but feel it’s a video driver thing. I’ll try to cover some of the new features, in the next post. Continuing from my previous post, I scored a lot of OS/2 Warp 3.0 media on ebay, and a kind person sent me some disk images of Warp 3.0 blue spine! Now the downside is that while Virtual PC 2007 supports XDF to some extent, it doesn’t like the XDF driver that comes with Warp 3.0… Which I guess isn’t a surprise, anyone would after all be loading the latest version, I mean who would load up and upgrade every version of OS/2 for the heck of it? 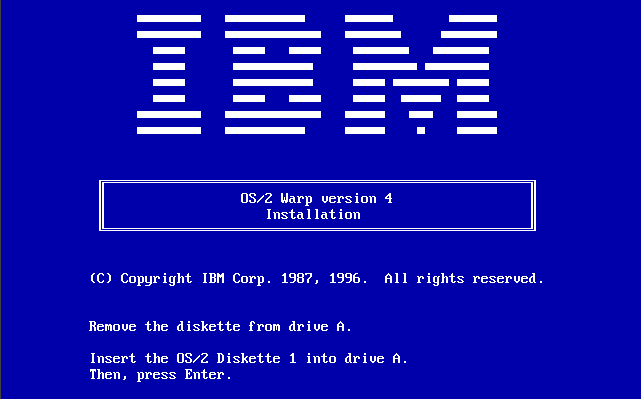 So as it is pointed out here, simply replace the ibm1flpy.add & xdfloppy.flt from OS/2 4.0 and it’ll work! 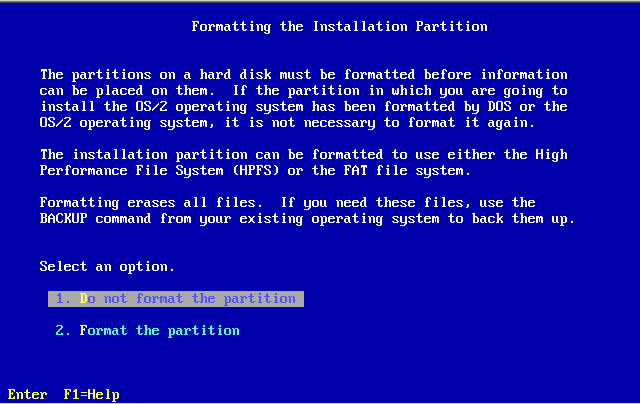 Now we get the usual, do we want to format my disk… As always the answer is NO… But it’s so delightfully colorful now! Then it’s a simple matter of feeding it disks, and waiting for it to chew through the 6 disks… I remember on a physical machine, these XDF’s weren’t exactly speedy. And then with that out of the way, it’ll be time to reboot, into the GUI, and to see how much hardware (if any) has been preserved. I had to change the Video to regular VGA, for some reason it this this is a Chips video…? And it had no idea about the CD-ROM. It did pick up the sound blaster, and it kept my printer! And as part of the update, it’ll let you compare your config.sys with a before and after… And honestly… WTF? Since the lines are so long, why did someone thing this was actually legible? I know it’s part of the legacy of config.sys, but really.. WTF! Well we’ll just trust it’s upgrade process, and let it ride! So we reboot, another splash logo and…. 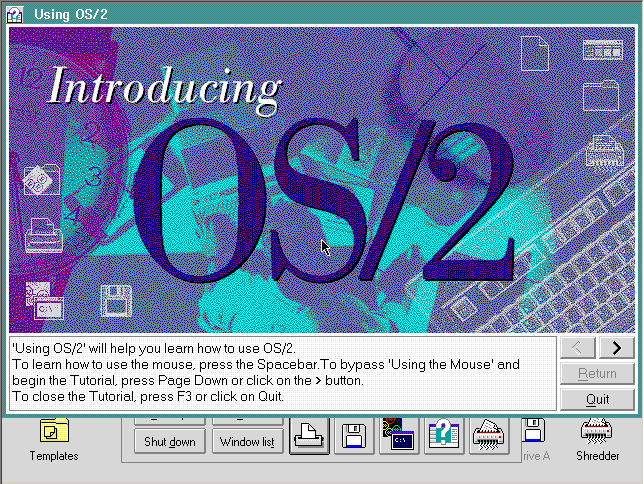 We not only get the desktop, the tutoral, Introducing OS/2. Which is really nice looking. It’s like they hired someone that’s not old school IBM to do this. It’s at least a big enough of a change since the days of OS/2 1.2’s tutorial. Closing that, I get the desktop. I’m no fan of the launchpad, so I just shred that thing from the get go. I know I know.. it’s like windows 95’ish but from 1994. And how did my legacy applications hold up? Bricks from OS/2 1.1 is still there, and still works great. 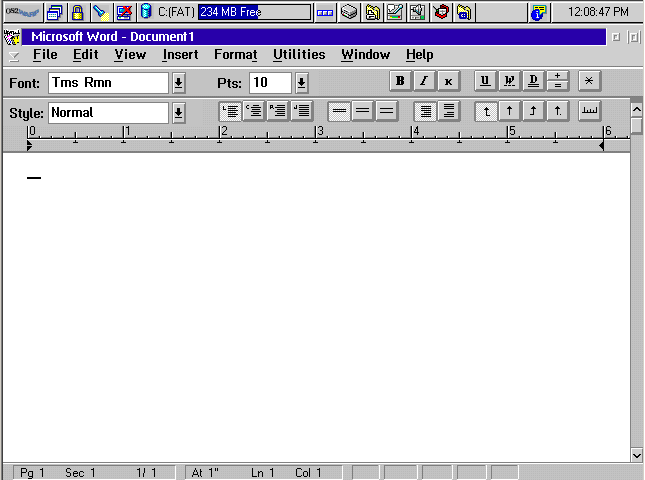 Word & Excel also working, just as they did when I installed them in OS/2 1.2. 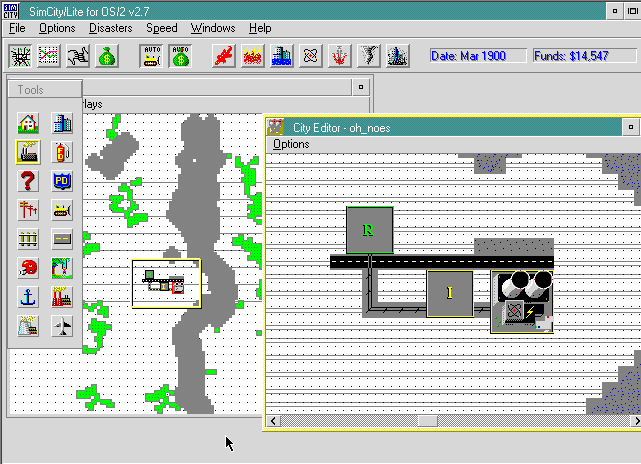 Even SimCityLite is working, along with DOOM. 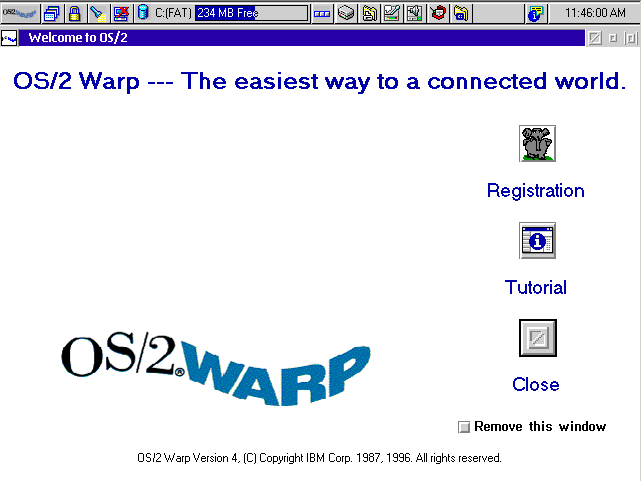 I’d have to give Warp an A+ on it’s migration from OS/2 2.1. It did look a little scary with the config.sys thing from hell, but really you can tell a *LOT* of work went into this release of OS/2. 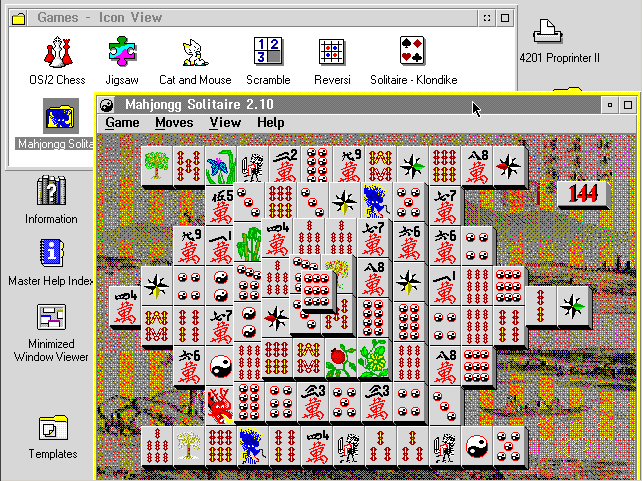 Speaking of games, Warp gave us.. Mahjongg Solitaire. I don’t know why it’s not spelled Mahjong, maybe it’s some British English vs US English thing? Anyways I’ve always associated the game with old ladies, and gambling rings. 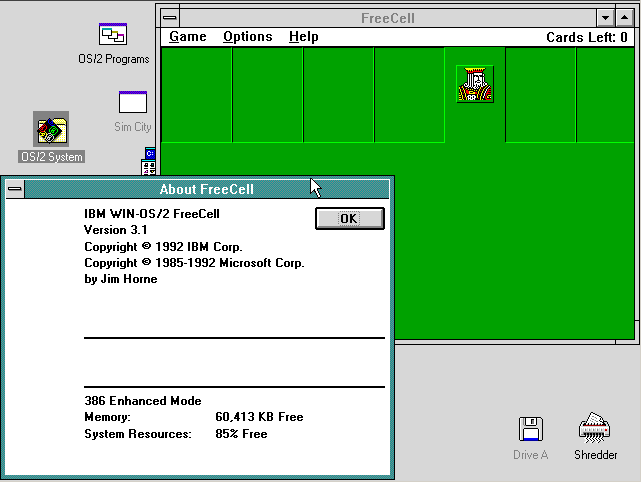 Honestly IBM would have been better off paying out some developer for a ‘top selling game’ and doing an OS/2 version. Even in OS/2 2.0 it is possible to write 32bit programs that’ll run in VGA 320x200x256 mode, which was still popular with plenty of the MS-DOS games of the time. But I guess even a full screen port of DOOM wouldn’t be all that IBM GREY/PC/DULL enough. Oh well even Tetris would have been a popular game. One thing that bugged the hell out of me was the sounds. It still was annoying to use OS/2 in an office with it constantly making noise… But in all fairness it was kind of the rage of the time, even Windows to this day has all the hooks in for it’s themes of custom mouse pointers, and GUI actions. Thankfully we’ve all moved beyond that. This was going to be the the effort to really wow people before Windows 95 shipped. In some regards it really was too little too late. The world was shifting away from the idea of an isolate powerful ‘workstation’ to the connected computer. As it does say on the box, this was the ‘on ramp to the information super highway. In my opinion this is where OS/2 weakspots really started to show through. First TCP/IP was an addon, not part of the OS. I don’t know how they thought slapping other diskettes in the box is ‘ok’ but it’s not part of the default install, and easily missed by novice users. The next, and forever lamented part is that it only included support for dialup. That’s right, although dialup was pretty much the norm for 1994, the world was rapidly changing, and the first cable modems were starting to be slowly rolled out. It also meant in the corporate world as LANS had taken over everything, and companies were just starting to think about TCP/IP and internet strategies, OS/2 was setup to be left out. Instead, someone at IBM decided that LAN based network should be a premium and people should pay twice the price for OS/2 Warp connect. This proved disastrous. Right about this time, Microsoft had released Windows for Workgroups, which was all about LAN / NetBEUI access, but they even did throw out a free TCP/IP protocol upgrade. 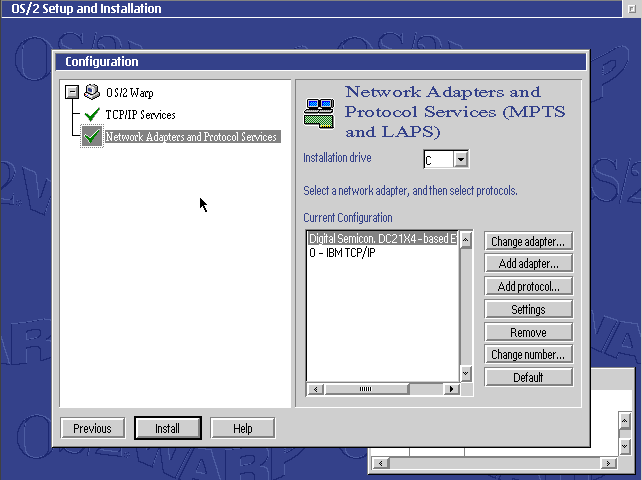 Windows NT 3.1 had finally shipped, and it too included LAN TCP/IP support. 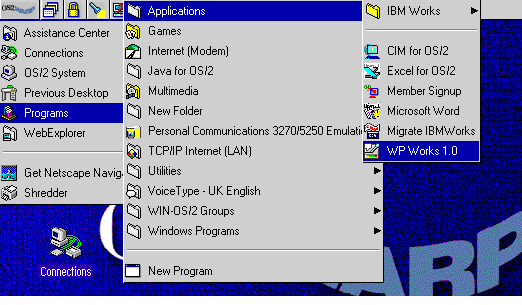 Then it was cemented in the more responsive Windows NT 3.5 which had a smaller memory footprint, and of course included support for PPP/SLIP along with LAN networking, and support for IP forwarding! That’s right you could use Windows NT 3.5 as a router!.. (Yes, even the workstation version). The other massive shift online was the coming rise of the web browser. Specifically Mosaic. 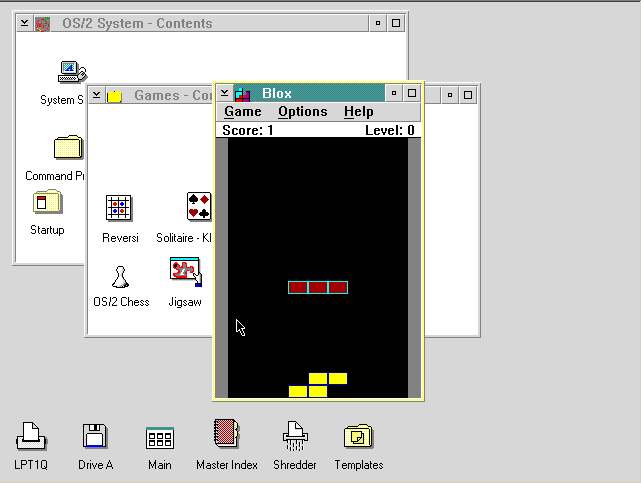 And Mosaic ran on all kinds of UNIX platforms. It even ran on Windows NT. They even made it ‘safe’ enough to run on Win32s. But there was no port to OS/2. 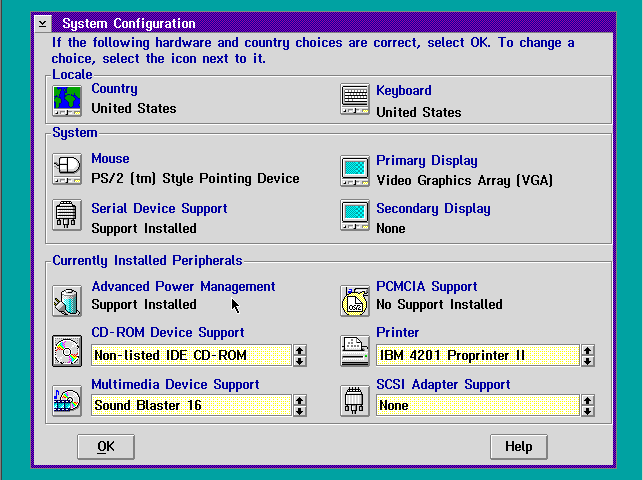 Thankfully someone recognized the importance of Win32s, and provided a driver to interface Windows 3.1’s 386 enhanced mode, to a workalike driver for Win32s. I chose the ‘runtime’ version of Win32s 1.1 .. I just wanted to see if it’d work. 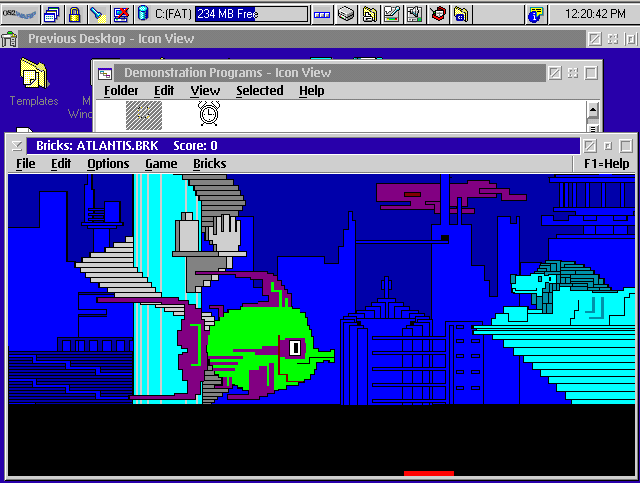 And the good news is that not only did it work, but it runs in seamless mode, with OS/2 1.1’s color scheme. Pretty snazzy. 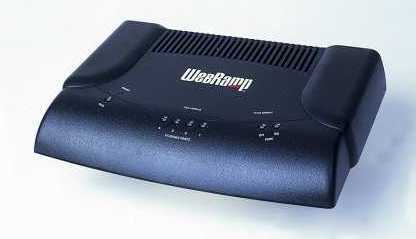 The web ramp was really cool, it had 3 serial ports, which let you connect 3 modems. It would then round robin your outbound requests so that people could share all 3 lines (if you had them) and it did NAT in hardware. This mean in the age of dialup this little guy would let you build a small LAN (it had a 4 port ethernet hub in the back) and suddenly all the computers at home with ethernet were online. 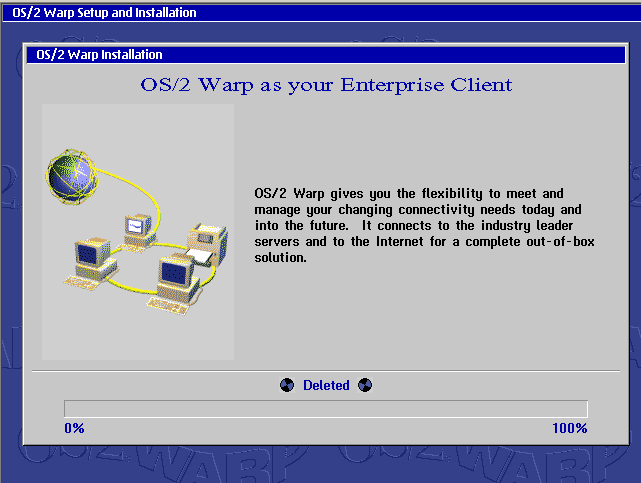 It’s stuff like this that really left people asking why did OS/2 warp have such a substandard networking stack. 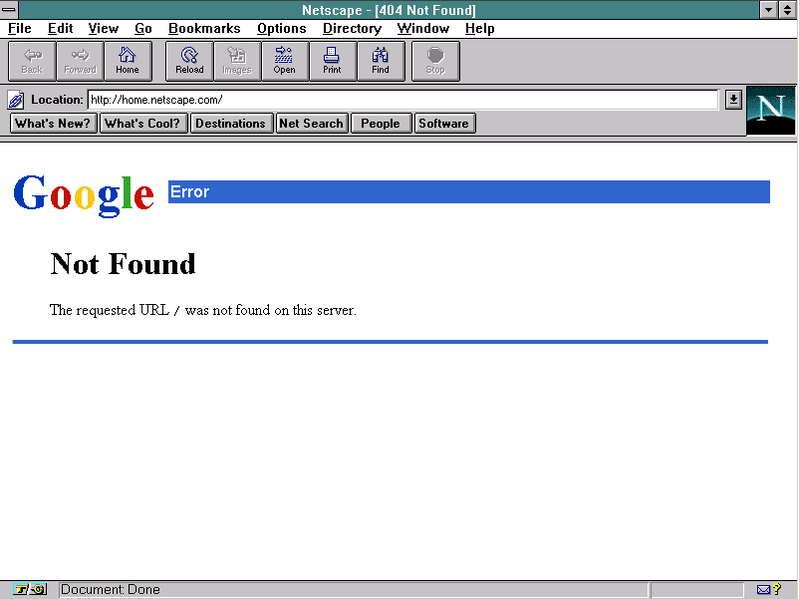 The year was 1994, the internet was starting to gain momentum. Windows 95 was a year and a half away. 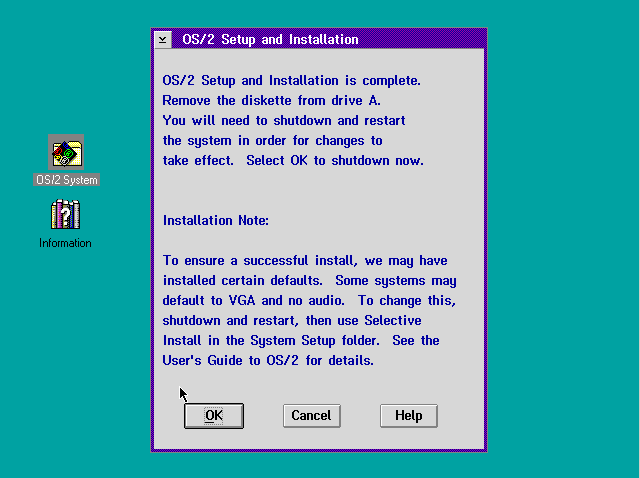 The answer to Windows 95 would no doubt be OS/2 4.0. Would IBM do anything about these shortcomings? We’ll find out as we upgrade to ‘project Merlin’ AKA OS/2 4.0. I had this issue with one VM where the mouse would either play dead, or it’d just hide in a corner. While I did have RDP access, it was.. quite annoying. So some googling around I found this. 1. 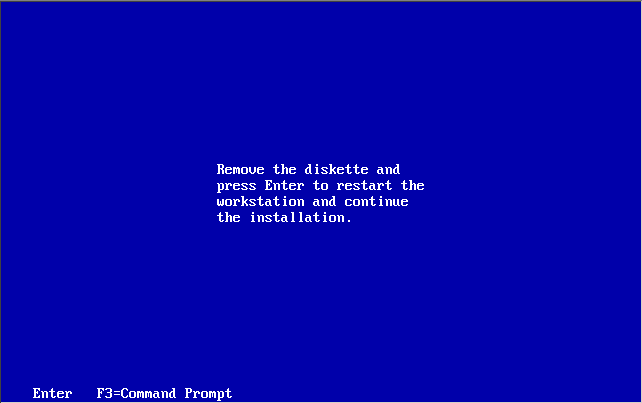 Do it all over again, but make sure to uninstall the Virtual Machine Additions before you convert the machine. ..then remove the value “msvmmouf” and any adjacent spaces from the Regvalue UpperFilters, leaving whatever else is there, then reboot. At least it’s something to pass the time with while waiting on phone calls…..
MSN old hooks are dying…. Do you know that crappy thing IE does to jump to MSN to start your page there? Yeah it’s still alive, but the ‘run once’ and configure your wonderious MSN session is.. kaput. It figures, Ie is finally becoming usable over a remote link thanks to bandwidth, and someone turning off the old MSN hooks. 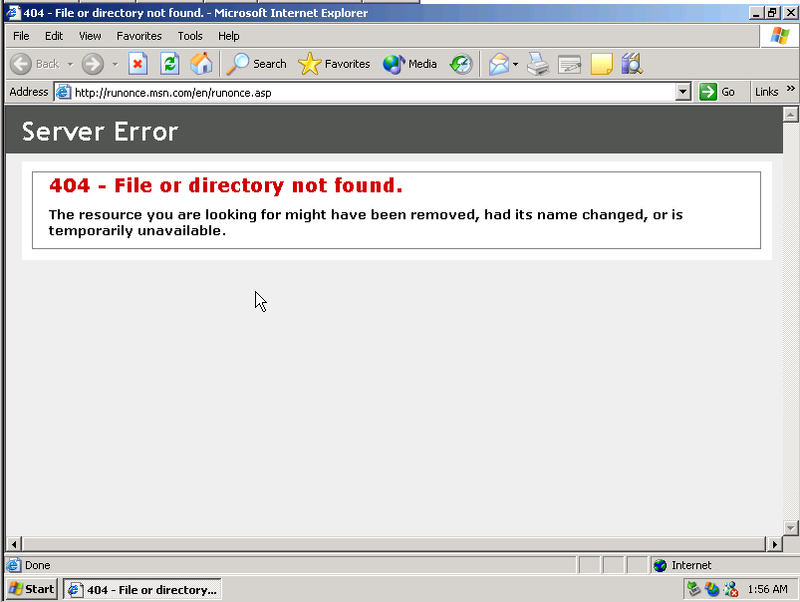 Author neozeedPosted on May 23, 2011 Categories internet explorerLeave a comment on MSN old hooks are dying….